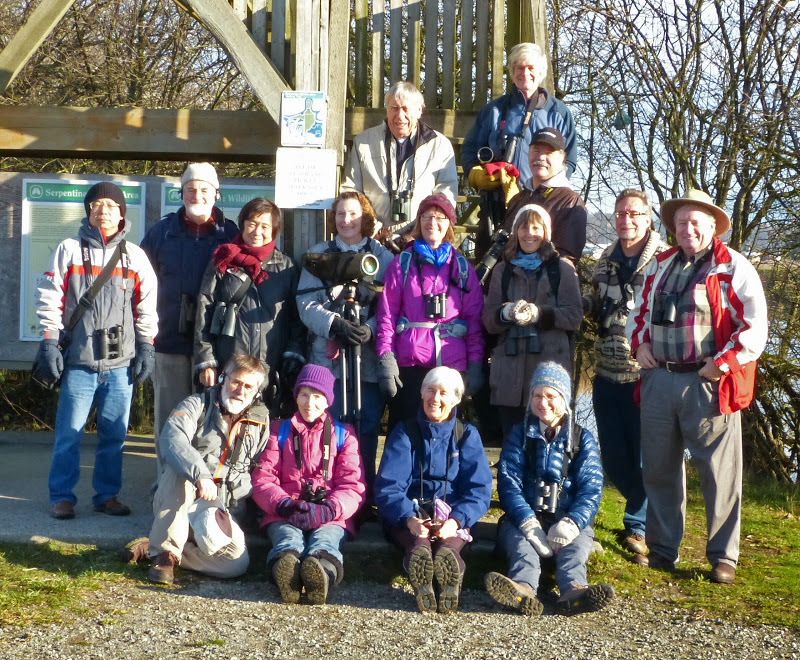 Fifteen DNCBers enjoyed another glorious Monday morning of birding at Serpentine Wildlife Management Area. Check out photos on our DNCB Picasa link. Only four (Glen, Terry, Mary-Pat and Sheila) met at and left from Petra’s at 7:30 a.m. Car-pooling nicely, they met the others who were waiting at the Serpentine Fen parking lot, except for one time-challenged veteran who obviously suffered from Grey Cup hang-over. While waiting for the recovering waif, the fourteen (previous four plus Ken & Anne, White Rock Al, local Serpentine expert Gareth, Jean, Bryan & Janet, Kirsten, Donna and Hey Jack – they love their names in print) toured the Barn next door in search of the often-seen Barn Owl. No luck, but they got good looks at both Ruby-and Golden-crowned Kinglets in the shrubs nearby. 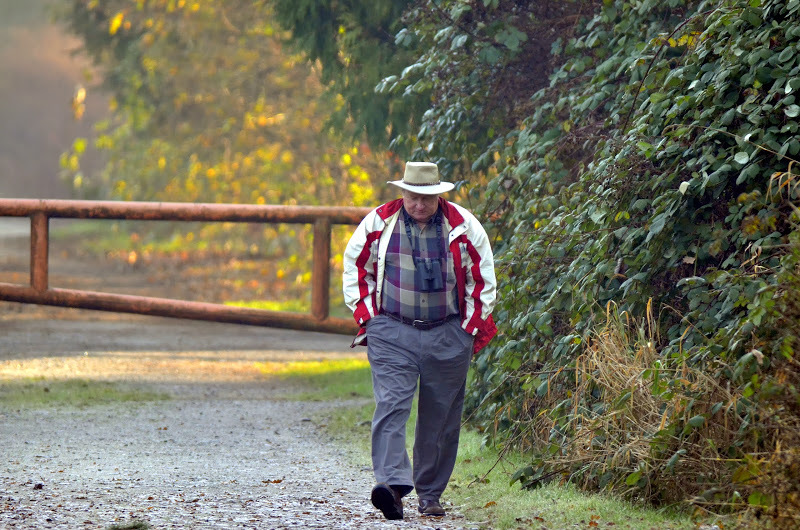 The lingering late-comer arrived to a sarcastic standing ovation as the group was entering the trail by the first Tower. 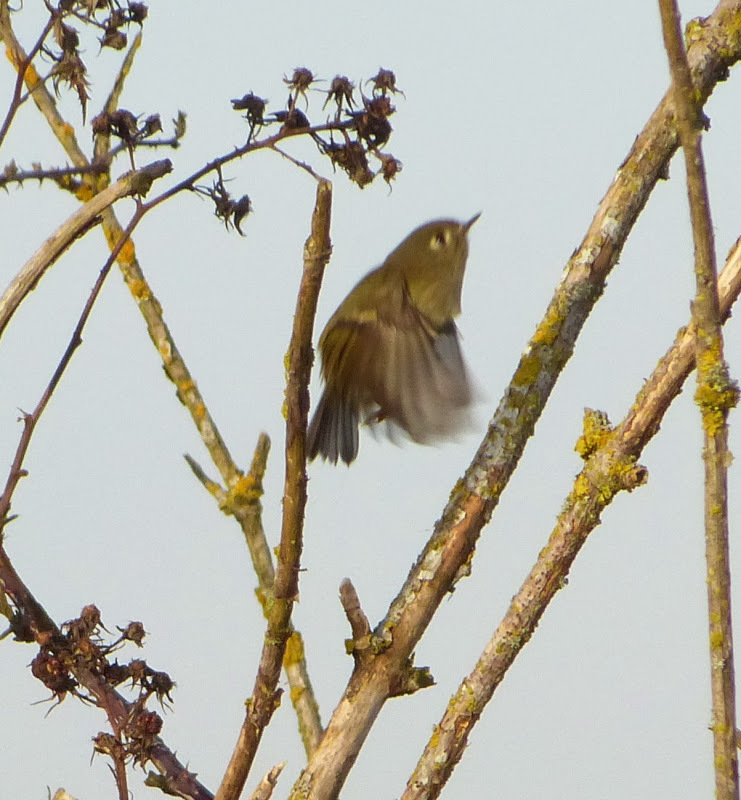 Lots of activity in the bushes here including Purple Finches and a Bewick’s Wren. In the pond beneath the tower was a huge flock of over 50 beautiful Wood Ducks with some Mallards, which were also quite nice in their breeding plumage. We continued toward the middle of the Park. A Northern Flicker, Downy Woodpecker, then a Marsh Wren then a Lincoln’s Sparrow caught our attention in the same bushes. In the big pond were lots of Canada Geese, American Wigeon, a few American Coots, Gadwall, Northern Pintails and Northern Shovellers, and a diving Pied-billed Grebe. Northern Harriers and Bald Eagles were often flying by and an occasional Red-tailed Hawk perched in a tree. One fly-by looked like a Rough-legged Hawk. When we got to the Serpentine River, a couple of Double-crested Cormorants were gorging fish down their gullets while Horned Grebes circled them. Some Common Goldeneye were in the distance. 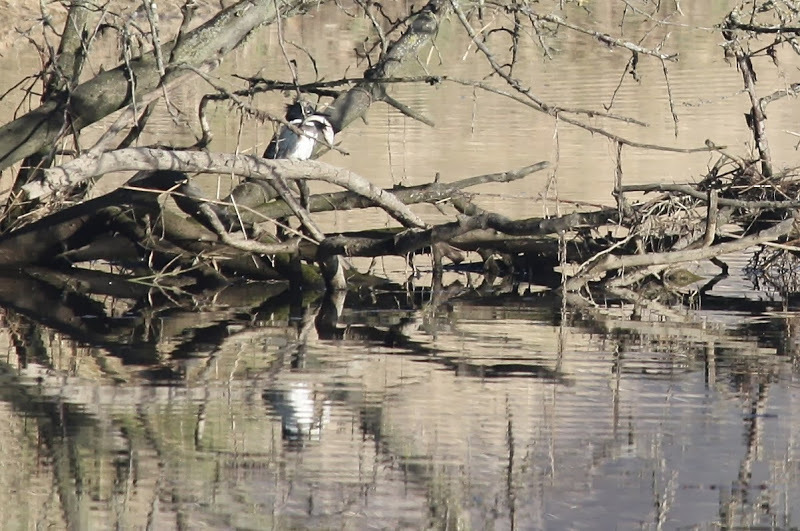 A male Belted Kingfisher perched on a rock on shore was very persistent, and entertaining, as it banged the fish in its bill on the rock, for nearly 15 minutes. We assume he finally swallowed it. In the trees, a flock of Savannah Sparrows flitting about seemed unusual to us. We also saw flocks of more usual House Finches and American Goldfinches. At the inland Tower, Bryan took the obligatory Group Photo. Green-winged Teal were in the pond below. Nearby in the river bend were a few Common Mergansers. We did not see a Northern Shrike, but a brilliant Eurasian Wigeon was a nice sighting near the former Oyster Bed farm. Someone had put some seed on the trail which attracted a number of birds, including an American Tree Sparrow, probably our Bird of the Day. I didn’t get a good look at it, but others did as the photos on our Picasa site clearly show. We also got good looks at other Sparrow species including, White- and Golden-crowned, Song and Fox. Juncos, Towhees, Red-winged Blackbirds, Starlings and other common birds were there too; there may have been a Brown-headed Cowbird. Gareth identified a flock (6) of White-fronted Geese flying by which I thought were a sub-species of Canada Geese. Also a small flock of Trumpeter Swans flew by glistening in the sunlight. Then, thousands of waterfowl were raised over the Bay in the distance and we talked about checking them out later at Mud Bay Park, but alas, we didn’t have time. We wandered back to the parking lot, enjoyed some of White Rock Al’s left-over Halloween nuts and Jean’s chocolates, but no PB sandwiches (hope PB Lorna returns soon) or beer, again. Approaching Noon, we shared a bit more inane conversation, then left for home. Instead of home for me, I went to Reifel with my kids and grand-daughter. Between hand-feeding the Chickadees and Sandhill Cranes, we saw hundreds of Shorebirds and Waterfowl, up close and personal, including a neat female Ring-necked Duck. Also met lots of Nats including Joanne and Marty, Kitty, and Jonathan & Lorraine there; hope Jonathan shares his American Bittern and Peregrine Falcon photos on our Picasa site. About 10,000 Snow Geese were feeding in a field near Reifel entrance. This entry was posted in *DNCB, American Tree Sparrow, Bald Eagle, Northern Harrier, Red-tailed Hawk, Rough-legged Hawk, Serpentine Fen. Bookmark the permalink.